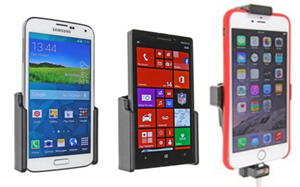 ProClip USA makes holders for many types of phones, including Android, Windows Phone, and iPhone. I happen to personally have experience with their iPhone holders. I have no affiliation with ProClip USA, I'm just a consumer, who bought mine like anybody else. I now have an iPhone X, see article updates below. 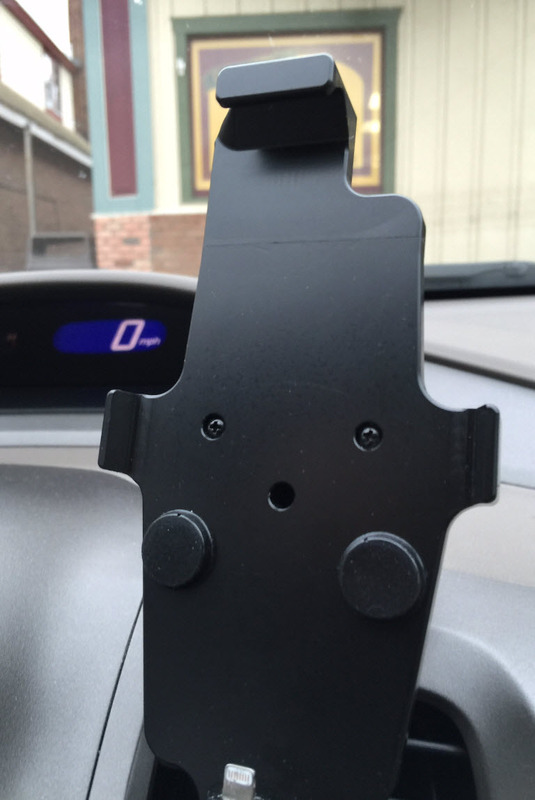 For 5 years now, I've had a sturdy, yet temporary mounting plate on my car's dashboard. No permanent alterations to my dashboard, no holes to drill. Works great. The very rigid plastics used seem to be holding up over the years. As phones models change, I just change the phone holder, not the mount. This spring loaded cradle-like holder allows me to use just one hand to "dock" my iPhone, then simply drive off. Yes, it's just a matter of putting the phone under the clip, pushing up, then aligning the Lightning connector and sliding down onto it. Takes about 2 seconds, although aligning it in the dark can be just a tad finicky. Once docked, my podcasts automatically resume playing, while my iPhone is charging. Even on those shorter trips. And the audio is piped to my car's radio through the same Lightning connector. Nice. Note that my visibility isn't blocked, even with the bigger iPhone 6 Plus display. The screen is within easy reach. I don't actually need to touch the screen though, since I use my steering wheel controls for volume and next/previous. I let the display just turn itself off, but I can also choose to unlock the phone with my fingerprint, then leave a dim Podcast playback display up on the phone. I don't need to avert my eyes from the road very far to see it. It's actually closer to my line-of-site than looking down at the radio or temperature controls. 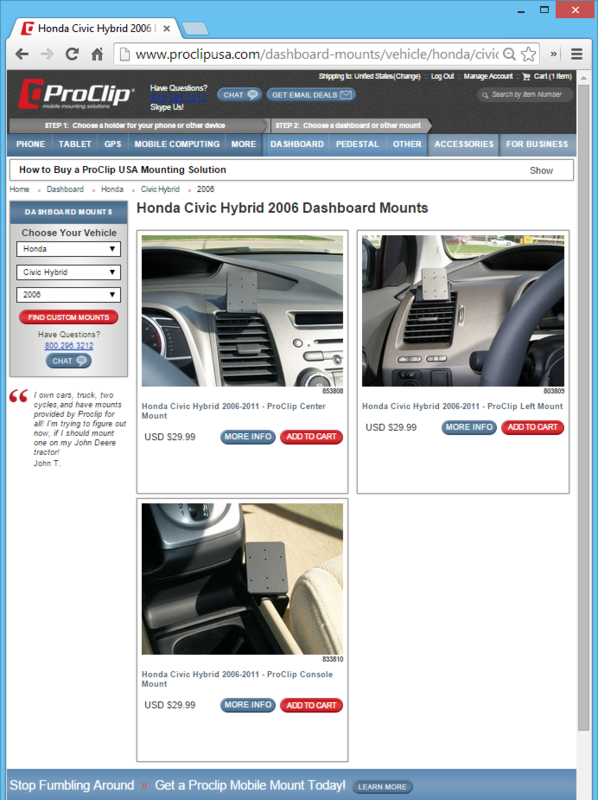 Back when I was searching for a mounting plate for my car, it was easy to choose the mine at the proclipusa.com site. 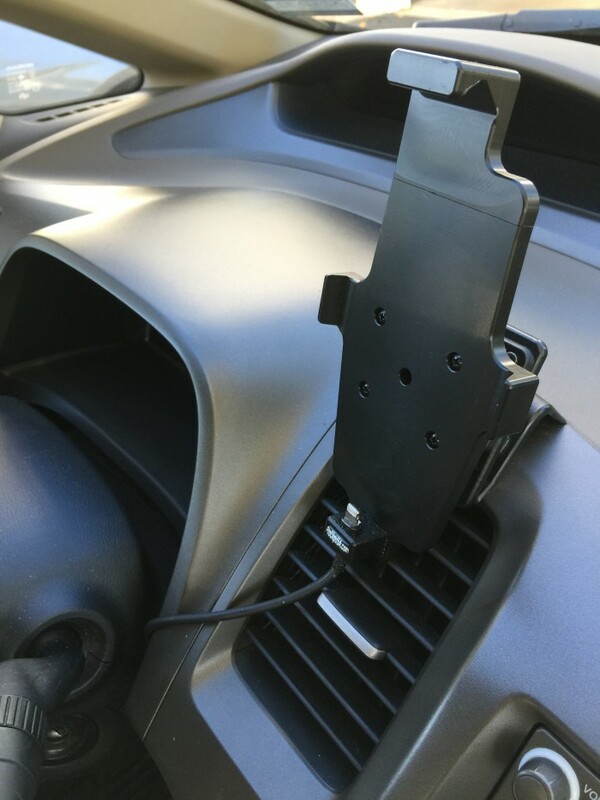 Give the ProClip USA Dashboard Mount Chooser a try, to see options available for your vehicle. For folks in Europe, Sweden's Brodit seems to stock the same parts, found on Amazon too. Next choice was the type of mobile phone mount. I already had the ProClip USA iPhone 5 mount, with the little tension holder at the top, to keep my phone tightly seated on the Lightning connector I provided. No need to redo any of that wiring, including my Neo Prolink that still charges this phone nicely, from icarkits.com. It fakes my factory radio into thinking a CD-changer is attached, with steering wheel button commands getting translated into iPod controls. As for that single Lightning-to-30 pin adapter cable to my phone, yeah, I painted it black. This configuration means my simple steering wheel controls work very nicely. For example, I skip ahead past commercials when listening to various Podcasts using Pocket Casts by Shift Jelly, and skip back to re-listen to something I missed. So when I got the iPhone 6 Plus recently, I knew that all I needed was a new cradle. Since I use an Apple iPhone 6 Plus Leather Case, and another iPhone 6 Plus with a different case occasionally shares the car, I chose a cradle that allows for a variety of case thicknesses. This means I chose the model 515663 Holder seen at bottom-right in the picture below. 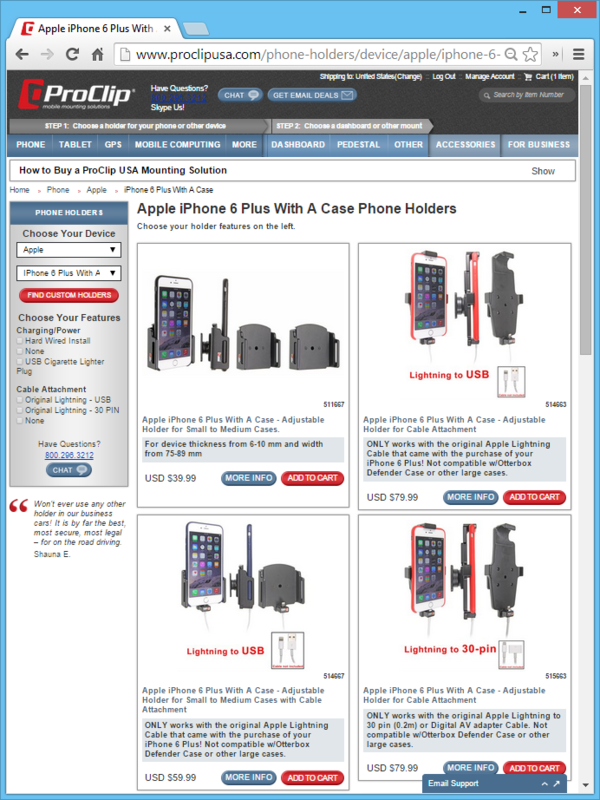 Here's the ProClip USA Phone Chooser, so you can check what they've got for your phone. For folks in Europe, Brodit (in Sweden) seems to sell the same kits. In case you're wondering, I use a Parrot CK3400 LS for Bluetooth hands-free communications. It's seen to the left of my tachometer. Using Bluetooth for just phone calls poses no conflict with the hard-wired audio line out that the lightning connector includes. Works great, a nice combination. You may also notice I have Honda's factory NAV. Also still works great, and I like using the wide angle view on those longer trips, showing the family progress at a glance. I sometimes supplement that GPS with Google Maps on my iPhone, which can be rotated 90 degrees for a more traditional GPS look, but I don't bother. Yes, ProClip USA's products cost a bit more, but the non-warping plastic, and build quality of the moving slider, have made the cost well worthwhile for me. I agree, the best car charger for my needs. It fits perfect and looks a lot better than these universal windshield mounts in my opinion. Protip: Remove the ProClip sticker, the mount looks a lot better without it. Researching the parts pictured above, it would seem the Black SendStation Dock Extender I'm using is no longer for sale. The CableJive 30 pin to 30 pin firewire to USB charging adapter is also no longer available either. 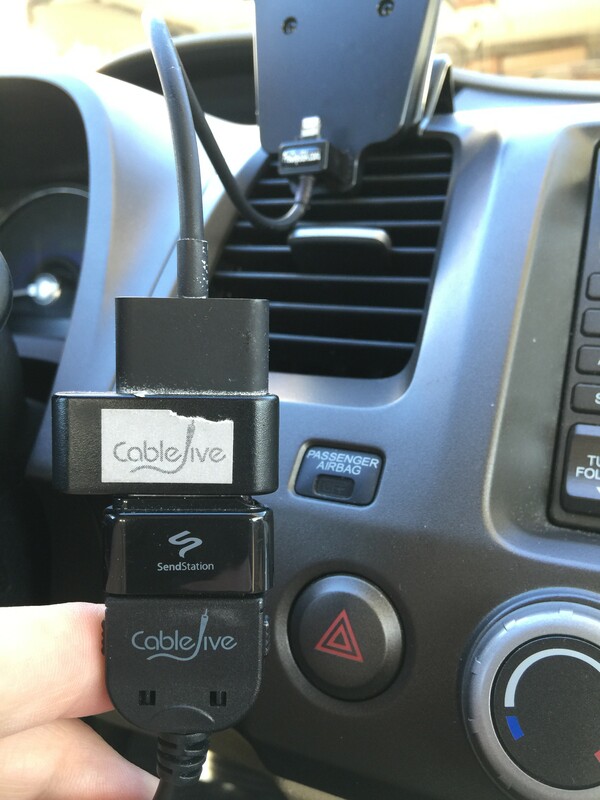 I've ordered one of these new converters, and will see how it goes, replacing both the SendStation and older CableJive adapters. Why? Because it seems lately that occasionally, when going for longer drives with the GPS running, I find the phone is actually slowly discharging. This behavior wasn't there before. It could also be that an upgrade to iOS 9.3 caused some some charging algorithm changes. At least I don't have any on screen warnings about using a 3rd party charger. I'm frankly amazed that I'm able to still enjoy seamless use of new iOS products in my 10 year old car. Amazon ASIN# B008UFL9L6 comes with 98 of these rubber bumpers, but you only need two. Prevents my iPhone 6 Plus from any pivoting/wobble, making single-handed docking easier, even at night. Things are going well, with the CableJive dockStubz+ Charge Converter and 30-pin Pass Through Adapter for iPhone, iPod, and iPad working fine. Even with the GPS running for long drives, my iPhone 6 Plus is still charging up. The stickiness of the 4.1mm bumpers mentioned above is good, but in the heat of summer, they do tend to slide down the surface of the ProClip about 1/8" / 3 mm. I suspect a simple dab of cyanoacrylate (crazy) glue could permanently prevent all such migration, which I plan to try, and will let you know how it goes. Since the size and shape of my new iPhone 7 Plus is the same as my iPhone 6 Plus it replaces, my ProClip continues to work quite nicely in my 2006 Honda Civic Hybrid. This is good! The way the mount is designed, I think it has a good chance of fitting future iPhone models as well, even when the size and shape changes a bit. A different product category is needed when I travel, with easy mounting for rental cars. 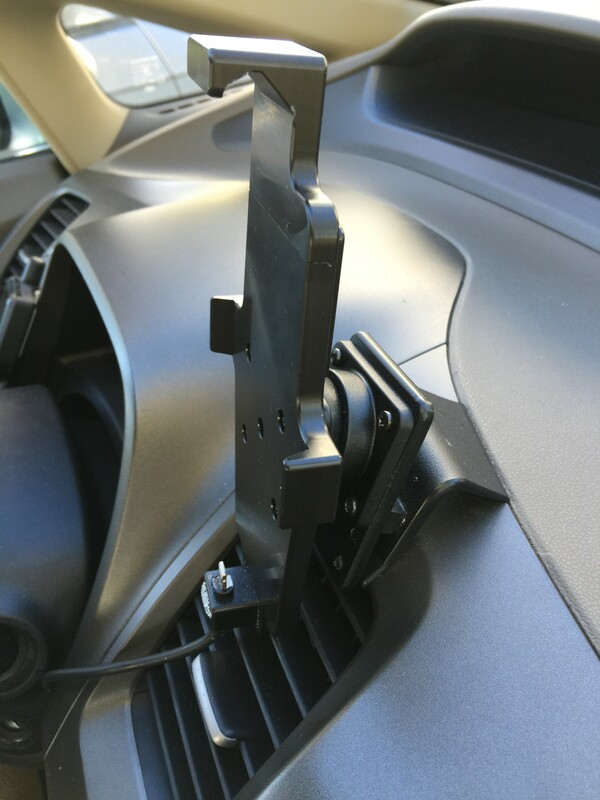 I've found just such a product in the Aikema Car phone holder for Air Vent, replacing the (failing/cracked) rubber feet without adjustability on my older Belkin model. For an overview of similar travel air vent clips, see what Nick Guy crafted at The Wirecutter. As for a charger that can handle even the toughest loads like GPS use when I'm in a rental car, the USB outlet found in most newer rental cars is rarely sufficient for charging when larger phones. Go with a full 2.4 amps for your portable charger, available in both ports of the iFlash 24 Watt Dual Port USB Car Rapid Charger. I've used 4 of these in various family member's cars over the last 2 years, without issue. A little bulky, but also very effective at charging, and helps prevent me from forgetting it at hurried rental-car drop-offs. No issues with charging. For example, if I leave Google Maps GPS routing running, and my Spotify audio streaming, no issues, the iPhone 7 Plus battery is still charging up just fine. This is good! I now have an iPhone X, and it will not fit in the 514663 cradle I installed for my iPhone 6 Plus three years ago. This is not surprising, but it would be nice if a single mount with more vertical spring-loaded travel would handle either size. The issue is that some drivers in the family have the iPhone 7 Plus, others have the iPhone X, which will make this transition period a bit more tricky. It also turns out the new item 514998 cradle for the iPhone X isn't yet available. I might need to rig up a gap-filling Black Lego adapter as a temporary work-around. I'll try things like temporarily strapping in some black Lego bricks with a black rubber band when I'm driving, at least until the new cradle is available. Stay tuned to see what I come up with.